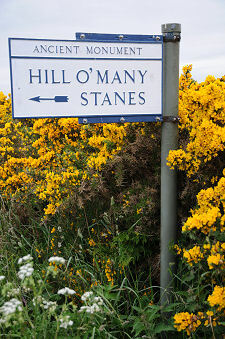 The Hill o' Many Stanes is signposted inland along a minor road from the A99 in the scattered hamlet of Clyth. You follow the minor road for a third of a mile before coming to an obvious signpost near a layby which provides parking, and then follow a path beyond a gate for the 100m or so to the ancient monument itself. 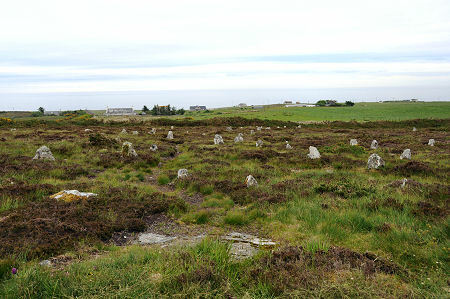 The Hill o' Many Stanes is well named. It comprises a roughly square area on the southern slope of a low hill otherwise covered in heather and gorse. On this hillside is an arrangement of some 200 stones, arranged in 22 not quite straight rows aligned very roughly north-south, which fan out a little at their southern end. Visitors are encouraged to stick to a path which goes around the perimeter of the site, and this allows you to appreciate the pattern of stones from the full range of available angles. Many ancient sites you visit leave you with a sense of wonder. 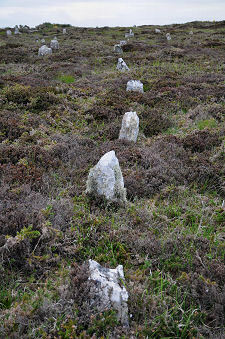 The Hill o' Many Stanes is rather different in that it leaves you wondering: what on Earth (or beyond) did the people who placed these stones here had in mind in doing so? An account written in 1871 said that at that time there were 250 stones visible, and it has been speculated that there might originally have been up to 600 stones present here. That is the number that would be needed to form the complete pattern only partially visible today, especially if you accept the possibility raised by outlying stones and settings for missing stones that the pattern might once have extended further east than it does today. 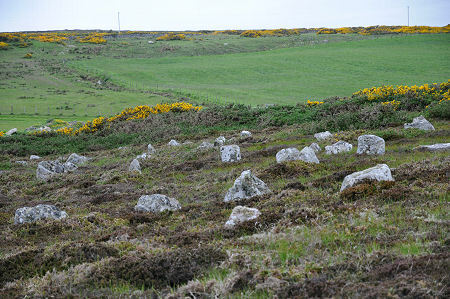 The individual stones used are not large by the standards, say, of a stone circle, but they are pretty impressive in terms of the effort involved in moving them. The largest are up to about 1m in height and 1m wide, and perhaps half that in thickness. Each has been carefully placed and aligned, and each was packed with smaller stones around its base when it was erected. 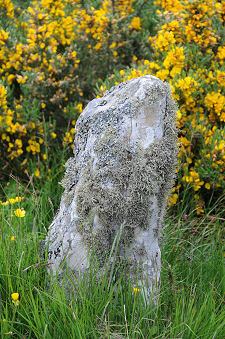 The Hill o' Many Stanes is the best preserved of a number of ancient monuments of a type unique to Caithness, and Sutherland. It is generally believed to have been erected some 4,000 years ago, but "believed" seems to the the right word, because little or no real dating evidence has been found for the stones. Proposed uses for the lines of stones have ranged from religious and ceremonial purposes to an astronomical observatory, but once again, no one really knows. This lack of hard knowledge brings a sense of mystery which adds greatly to the attraction of a visit to the stones: indeed, to be honest, it is the main attraction of a visit. And as you wander around the perimeter of the site it is difficult not to wonder whether the whole thing might not be some antiquarian's practical joke. We'd only know for sure if a future archaeological investigation found the remains of a clay pipe from the 1700s or 1800s under the base of a stone. Or maybe we've just been watching too much Time Team.